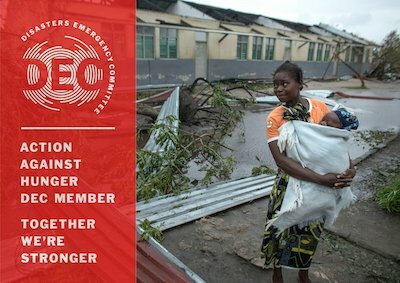 Please help people in Mozambique, Malawi and Zimbabwe affected by Cyclone Idai. 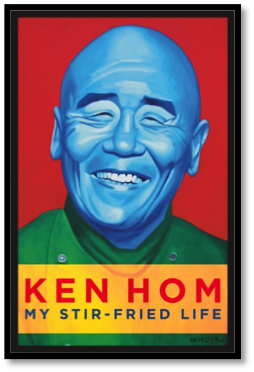 I was introduced to this dish one evening when I dined with Madhur Jaffrey and her husband at the Shun Lee Palace restaurant in New York. She suggested it to me, predicting that I would appreciate the imaginative interplay of pungent aromas and spicy flavours. How right she was. This is an exciting taste treat and very easy to prepare. Peel the prawns and discard the shells. Using a small sharp knife, split the prawns partially and remove the fine digestive cord. Pat the prawns dry with kitchen paper and combine with the salt, cornflour, and sesame oil and mix well. 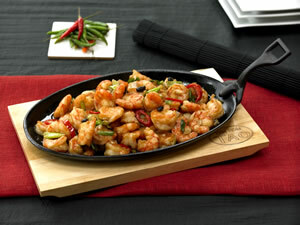 Heat a wok or large frying pan until it is hot, then add the oil and prawns. Stir-fry for 1 minute and remove the prawns with a slotted spoon. In the remaining oil, add the chilli, black beans, garlic, and spring onions. Stir-fry for 20 seconds and add the vinegar, soy sauce, and sugar. Stir in the cornflour mixture and return the prawns to the wok. 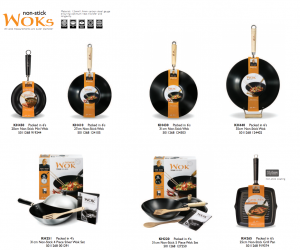 Cook for another 2 minutes and serve at once. The sauce can be doubled and toss with fresh egg noodles or rice noodles for a one-dish meal. This recipe takes advantage of the quick cooking characteristics of rice noodles. Cooked for about two minutes and then combined with the blanched broccoli for another few minutes, the noodles make a delectable vegetarian dish for one or two persons. Any leftovers reheat (stir-fry) very nicely. Fill a large pot with water, add salt, and bring to the boil. Separate the broccoli heads into small florets, and peel and slice the stems. Blanch the broccoli pieces in the boiling water for 4 minutes. Place the rice noodles in a large heatproof bowl. Drain the hot water from the blanched broccoli into the rice noodles and immerse the broccoli pieces in cold water. Drain the broccoli thoroughly. Let the noodles stand in the hot water for 2 minutes, then drain. Heat a wok or large frying pan until it is hot, then add the oil, garlic, and spring onions. Stir-fry for 20 seconds. 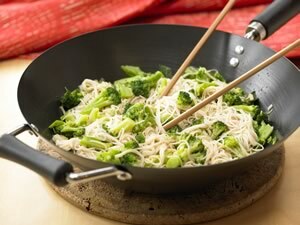 Stir in the drained rice noodles and broccoli and continue to stir-fry for 1 minute. Then add the water, oyster sauce, dark soy sauce, and sesame oil and cook for 2 minutes. Turn the mixture onto platter and serve at once. This recipe can be easily doubled for a larger crowd. 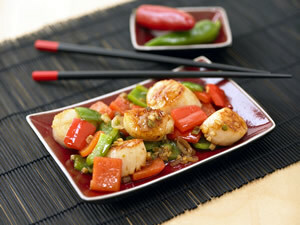 If you like it spicy, add 2 teaspoons of chilli bean sauce with the oyster sauce. In this recipe, I combine them with nutritious, flavourful, and colourful red and green peppers. The result is a festive looking dish that belies its ease of preparation. Perfect for a family meal or as the centerpiece of dinner party prepared on short notice. Dry the scallops with kitchen paper and set aside. Cut the peppers into 1 in (2.5cm) squares. Heat a wok or large frying pan until it is hot, then add the oil, spring onions, garlic, and ginger, and stir-fry for 10 seconds. Then add the peppers and stir-fry for 2 minutes. Stir in the scallops and the sauce ingredients. Continue to cook for another 4 minutes. Serve at once. You can substitute asparagus, courgettes, or mange-tout for the peppers. 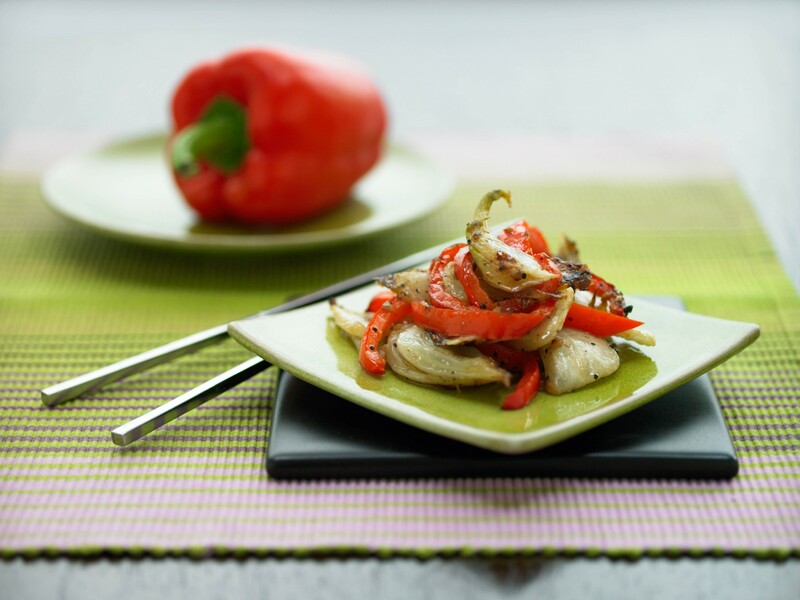 If you like very spicy food, add two fresh chillies to this recipe. Use mussels or clams instead of scallops. Because of their sweetness and succulent texture, peas are a popular dish in any meal. Here I have enhanced their virtues with some spirited seasonings. 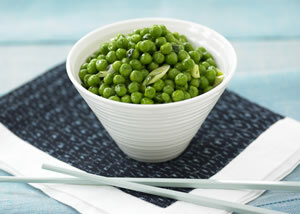 If you are using fresh peas, blanch them in boiling water for 2 minutes, drain and set aside. If you are using frozen peas, let them thaw at room temperature. Heat a wok or large frying pan until it is hot, then add the oil. Add the peas and stir-fry for 30 seconds, then add the fresh coriander, spring onions, garlic, sugar, salt and pepper and continue to stir-fry for 3 minutes or until the peas are cooked. Add the sesame oil and give the mixture a final stir and serve at once.